Information on the MBA in Cybersecurity can be found here. Organizations across all industries are looking for skilled, ethical cybersecurity professionals who can protect their critical infrastructure from the threats of cyber criminals. Be the one out front that is anticipating and stopping cyber-attacks before they happen by bringing your competitive nature, strategic mind and skills to outwit and outsmart cyber criminals. The Cybersecurity program will provide the training and understanding of areas, including digital threats, network security, compliance, and securing private assets, to prepare you for this high-demand, fast-paced and fulfilling career. Through experiential learning that provides real-life situations and skills, this degree will not only allow you to fulfill your passion of safeguarding the wellness and security of people and organizations, but it will also open the door to the significant number of well-paying jobs that exist locally and internationally. Discover how JBU is equipping students to combat threats to information security. 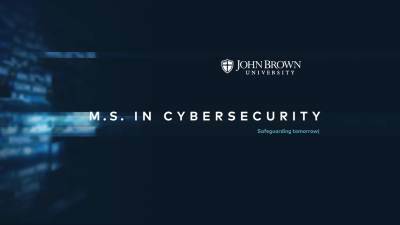 Why study Cybersecurity at JBU? JBU offers hands-on learning. You’ll work with firewalls, intrusion detection systems, and other tools that are essential to safeguarding information. Our 30-hour program is delivered 100% online. Through video and virtual labs, you will be able to engage with your professors and classmates while keeping a flexible schedule. At JBU, you’ll learn from passionate, knowledgeable instructors with years of professional cybersecurity experience in a variety of sectors, including healthcare, energy, retail, and government. The cybersecurity industry is full of ethically challenging situations. JBU will teach you how to navigate those situations within the context of a Christian worldview. The M.S. in Cybersecurity is 30 credit hours and can be completed in under two years. Mr. Steve Helms has worked in the network security industry since 1996. His career began in the energy sector at Schlumberger and continued at Reliant Energy in Houston providing technical systems security administration and infrastructure design. After moving to a consulting role in 2000, he began the vulnerability assessment practice at Accudata Systems and spent 17 years helping companies in numerous industries – including energy, healthcare, education, and finance – comply with best practices and laws through ongoing technical security assessments and penetration tests. He earned his undergraduate degree in management information systems and his graduate degree in cybersecurity. In addition to his technical abilities, Mr. Helms is a businessman and has conceived, designed, developed, operated, and eventually sold a small Internet software as a service (SaaS) company. Additionally, he has been an integral part of a start-up venture in the healthcare industry providing a software solution to improve medication adherence. Mr. Helms and his entire family spent a month as missionaries to Belize in 2014 and hope to return for a longer stay in the future. He and his wife, Shelli, have five children: Natalie, Courtney, Connor, Garrett, and Joshua. They are involved with a growing church plant in Siloam Springs and truly desire to "live a life that demands a gospel explanation" (based on 1 Peter 3:15). Dr. Tim Gilmour joined the engineering faculty in August of 2012. Dr. Gilmour received his B.S.E.E. from Cedarville University in 2003, his M.S.E.E. from Penn State University in 2005, and his Ph.D. from Penn State University in 2012. For his masters' research he tested different signal processing methods for brain-computer interfaces. For his doctoral research he applied signal processing to examine the effects of cell transplants on brain electrical activity in Parkinson's Disease. He has published four journal papers and presented seven conference abstracts. In his free time he enjoys spending time with friends, reading, hiking, music, playing Frisbee and Ping-Pong, learning about other cultures, and spreading the good news about Jesus Christ.